If you’re like me, the name Belkin immediately evokes memories of fiddling with the radio, trying to find an all-static station that an iPod radio transmitter could hijack. Now it seems Belkin, a company best known for its A/V accessories, has stepped into a consumer electronics sphere mostly occupied by Slingbox with intent to compete directly in the home TV on-the-go market. For us, it seems like the demand for this kind of service just isn’t commensurate with the number of companies offering it. With the Belkin@TV — Belkin’s new streaming media device — the company hopes to tune into what’s still a largely untapped, niche market and claim its slice of the pie. We’ve got no horse in this race, but it’s refreshing to see an arena that’s been pretty static for the last half decade, get shaken up a bit. 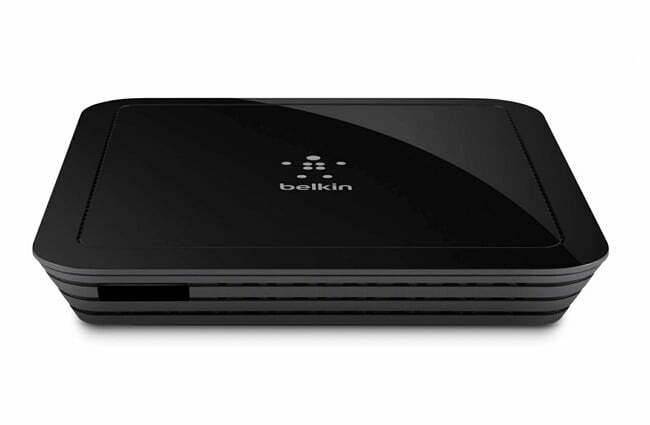 Using the Belkin@TV you can access your home TV – DVR included – on any mobile device on your Wi-Fi network. You can also record directly onto phones, tablets, etc. if you’d like to keep certain shows after you’ve erased them from your DVR. Up to eight devices connect simultaneously to the set-top box, which features two component inputs an analog stereo input, and an Ethernet port. It’s also compatible with Mac and Windows PC’s, Android and iOS devices, and standard or high definition TVs. Belkin@TV is available at many popular retail outlets and retails for $180. Compare that to the Slingbox 500 & 300, released earlier this month, which retail for $300 and $180 respectively.